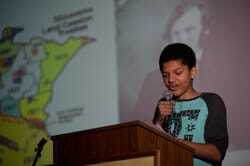 A student-led campaign to rename Alexander Ramsey Middle School in Minneapolis is underway. The school community is exploring the history of Alexander Ramsey and searching for a new name that would better reflect our values and inspire our students. Who was Alexander Ramsey? Why does he make for a controversial namesake? 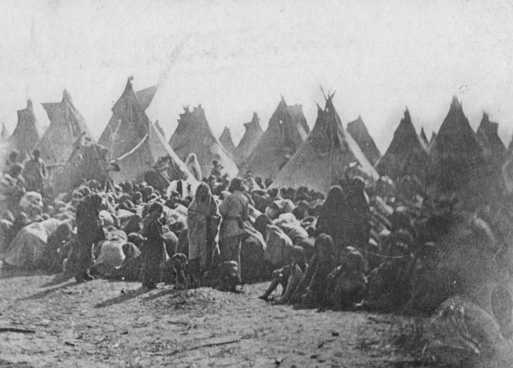 Photo: Bishop Henry B. Whipple preaching to the Dakota at the Fort Snelling concentration camp, 1863. ​“I support the students, staff, and community at Alexander Ramsey Middle School, who are leading an important discussion on the name of their school. Governor Ramsey’s encouragement of violence against innocent people is appalling, and I repudiate it fully. That violent language and behavior may have been commonplace 150 years ago in Minnesota, but it is not acceptable or allowable today. "I am appalled by Governor Ramsey's words and by his encouragement of vigilante violence against innocent people; and I repudiate them," Gov. 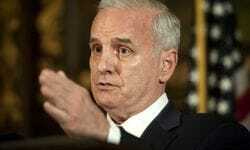 Mark Dayton said in a statement released Thursday. "The viciousness and violence, which were commonplace 150 years ago in Minnesota, are not accepted or allowed now." Dayton asked Minnesotans, "to remember that dark past; to recognize its continuing harm in the present; and to resolve that we will not let it poison the future." "I got the chills when I heard. Oh, man, that is such a good feeling," said Corbin Shoots the Enemy, a member of the Crow Creek Tribe that lives on a South Dakota reservation where many Dakota were sent after the war. "It's hard to explain the feeling I have right now, but I say thank you to the governor. We're coming home." - Alexander Ramsey was born in Pennsylvania in 1815 and graduated from Dickenson Law School in 1839. - Alexander Ramsey served as a Congressman from Pennsylvania from 1843-1847. - Alexander Ramsey lived during the time known in standard American History books as Westward Expansion. - Millions of European and American settlers moved into the plains and beyond the Rocky mountains; from sea to shining sea. Native Americans call this time period the “Time of Colonization,” the time when their lands and cultures were taken from them. It was the time of the Trail of Tears and the Mexican-American War. ​- Alexander Ramsey was appointed by President Taylor to be the first territorial governor of Minnesota in 1849. Two years later he was a government representative at the signing of the Treaty of Traverse de Sioux, a treaty that reduced the size of the Dakota homelands by 24 million acres. - Alexander Ramsey was brought up on charges of fraud or cheating at the treaty signing, secretly agreeing to have treaty payments paid to European American fur traders instead of paying the Dakota, as the treaty required. He was acquitted, or cleared, of the charges. - Alexander Ramsey was elected governor of Minnesota in 1860. He was a leader at a time when the prairies were converted into farm fields and towns all across southern Minnesota. - Alexander Ramsey was governor when the US Civil War broke out in 1861. He was in Washington DC when it started and was the first to volunteer soldiers to help fight the Confederate army. - Alexander Ramsey was governor when the US Dakota War broke out in southwestern Minnesota. The U.S. government was not paying its end of the treaty agreement and Dakota indians fought white settlers on the prairie. Many settlers were killed. - Alexander Ramsey said, at the end of the war, that all the Sioux or Dakota Indians should be exterminated from Minnesota. - Alexander Ramsey was governor when 38 Dakota men were hanged and 1500 were held in a concentration camp at Ft. Snelling. All of the Dakota were removed from Minnesota and sent to prisons in Iowa or reservations on barren land in South Dakota. ​- Alexander Ramsey served as a senator for Minnesota from 1869-1875. - Alexander Ramsey’s name was given to our school in 1931, 28 years after he died.